Miss Barbell Productions have developed web sites for many Internet and Intranet clients, some of whom we have listed below. Hand made gifts for your loved ones, friends or even a treat for your own home. Hearts are not just for Valentine's Day or Christmas they are for life. 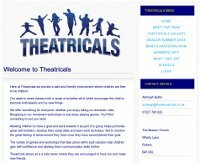 Theatricals is a childrens workshop and drama group from the age of 4 upwards. Week to week classes hold a range of activities, all of which encourage your child to become enthusiastic and try new things. Independent midlands based professional photography for all occasions. Children, Portraits, Weddings and Special Occasions are all catered for. 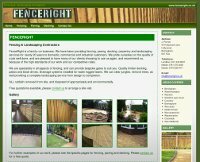 Midlands based company providing fencing, paving, decking & landscaping services. The Birmingham Adult Dyslexia Group is a self-help group, providing support to those with various forms of reading difficulties in and around Birmingham. Current work for BADG involves website maintenance, and DNS administration services. KRS Scooters provide body work, repairs, servicing and MOT testing for scooter enthusiasts from around Birmingham and the West Midlands. White Doves for release at weddings, funerals as well as other memorials and special occasions. A high quality drive and pathway cleaning service based in the West Midlands. A bi-monthly music club, with DJs specialising in Northern Soul and Modern Music, occasionally featuring live bands. The QA Hackathons are small events that now happen annually, to allow core developers within the Quality Assurance community to get together and resolve issues within the toolsets they use. Having held the second QA Hackathon, Birmingham Perl Mongers host the domain for 'qa-hackathon.org', with this site used as a launch site to the dedicated sites for each annual event. 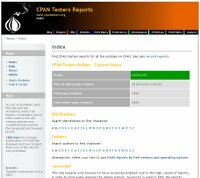 The CPAN Testers Family consists of the Reports, Statistics, Wiki, Preferences and Development websites, together with many supporting tools. All sites have been designed, developed and are maintained by Miss Barbell Productions. Provides the data and feedback for the annually run YAPC Conference Surveys. In addition the sites that run the actual surveys, providing a Conference Feedback survey, Master Class course surveys and Conference Talk surveys, are all developed, hosted, and maintained by Miss Barbell Productions. Maisha is an Open Source micro-blogging social network application, which is designed to run from the command line. A Perl user group for Perl programmers in and around Birmingham and the West Midlands. Personal website for Barbie, founder of Miss Barbell Productions and Birmingham Perl Mongers. ARK were a progressive rock band based in the Black Country, originally performing from 1985 to 1995, but have since reformed. 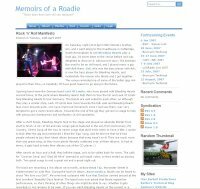 The web site was recently redesigned from a fan's perspective, featuring archives from the band through the years. Folk & Blues from Alvechurch in the West Midlands. Slim Pickins have been performing their unique brand of folk, roots and blues around the Midlands for several years. They now host their own Roots 'n' Blues Club at The Alvechurch Social Club each month. Below are some of the sites, for which we were involved with for at least one implementation of the website. Please note that many of the sites have now been reworked and redesign, and our original designs and implementations may longer be used. Some are no longer maintained. The Open Guide to Birmingham is a site that is part of the OpenGuides network, providing localised information for visitors to Birmingham and the West Midlands. Style Stop provides fashion advice for women on clothing styles relating to thier body shape and colour. The 2006 YAPC::Europe Perl Conference was hosted by Birmingham Perl Mongers. Extensive web site designed to promote both the conference and Birmingham. The 2006 YAPC::Europe Perl Conference was hosted by Birmingham Perl Mongers. The wiki web site designed to allow conference attendees to communicate with each other and link to external information and slides relavent to the conference. The Society of Chief Quantity Surveyors. (2003-2004) Site designed to promote the society and make documentation available to the public. Coventry Schools Learning Net. (2001-2002) website designed & developed on behalf of QIIS. Current site now maintained by i2Q based on the original design, using the Mephisto code base (an early prototype of Labyrinth). (2001-2002) website designed & developed on behalf of QIIS. Current site now maintained by i2Q based on the original design, using the Mephisto code base (an early prototype of Labyrinth). CUSP were an indie/pop band based in Leicester. Alas no longer together. Our staff have also been previously involved with the website design and development on older sites for The Register (1999-2001 on behalf of TW2), Gartmore Investment Management PLC (2000-2001 on behalf of TW2), Irwin Mitchell Solicitors (IM Online, 2000-2001 on behalf of TW2) and System 5 Intranet Site (AAH Meditel, 1998-1999). Copyright © 1998-2015 Miss Barbell Productions.